The Mortch hoverboard segway is a solid self-balancing scooter for the musician who loves to take his favorite music with him wherever he goes. This is the perfect budget alternative! Package contains: Charger, User manual, Package box, Wireless remote controller and a Carrier bag is included. Wireless remote, Turn it on/off & adjust settings with the press of a button. 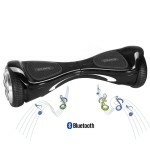 Price, Cheapest hoverboard with bluetooth and speakers available. Distance, Decent distance giving and a good recharge time giving you less downtime. Product details, The details on the product page are very confusing, different suppliers giving different specs. (Check ours for the correct product specifications) Speed, Not for the daredevil speedster. It has good speed just not that good. We ordered this cheap Mortach Hoverboard with speakers and it got delivered within the stated time frame. It had great packaging and the package contained a lot of free stuff. We got a carrier bag, remote control, charger & a user manual in English. So we went on to our testing phase and I have to say for such a cheap device many things can go wrong, but they didn’t. This scooter is surely an amazing device if you are looking for a hands free segway with the ability to play your favorite music on it. People are literally turning around just to watch me ride around with it. If you do not like being in the spotlight you probably shouldn’t turn up the volume to much. Since almost everyone we rode by turned around and stood there just staring at me. The speakers where pretty solid and the sound quality is great. The speakers are well positioned and with its big 8″ wheels you can easily go over pot holes and bumps in the terrain are handled with ease. It’s rubber coated wheels give it great grip and it can handle climbing 20 degree hills without any problems at all. This is all thanks to it’s big 8 inch wheels which seems to be of very high quality and doesn’t give you that plastic feeling. We clocked it at .3 mph faster than what is stated in its product details and the acceleration is consistent all the way up to its top speed at aprox. 6 mph. We tested the range of the Bluetooth and without any obstacles it had no problem at 15 ft which is just perfect. The music function is really something we missed while doing our extensive test on the Leray. We sure think this device is well worth the price-tag and it is the perfect budget hoverboard segway with speakers & Bluetooth. 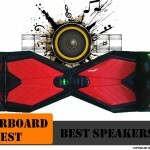 It’s wireless speakers will give your favorite music great sound and high volume if needed. Just think about your neighbors and other people on the street. You wouldn’t want to upset your fellow pedestrian, remember not everyone has the same taste in music and this needs to be respected.